Own this 100% Cotton AC/DC T-Shirt. These high quality, two sided printing shirts, are durable, preshrunk, and machine washable. To buy one of these limited quantity shirts press the orange button above now. AC/DC's Album Black Ice, a 15 track ambum, was released worldwide on October 20, 2008 it was the band's first studio release in eight years, and was produced by Brendan O'Brien. Simular to Stiff Upper Lip, it was recorded in Vancouver, British Columbia, at The Warehouse Studio. Black Ice was sold in the US only at Wal-Mart, Sam's Club and the band's official website. 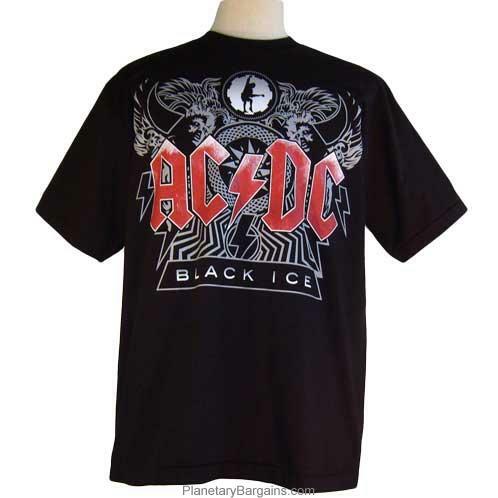 With the release of Black Ice on October 20 2008 in North American, Walmart and Columbia Records created "Rock Again AC/DC Stores" with the album Black Ice in centre stage. It was the first time in Walmarts history that such a large area of the sales floor was devoted to the release of a new album. AC/DC is a rock band formed in Sydney Australia in 1973 by brothers Malcolm and Angus Young.